Evernote is my go-to organizing tool. I use it for lesson plans, lesson resources, project planning and tracking, client information, blog ideas, and personal stuff like important documents, photos and more. I pay for the Premium version because I wanted the premium features and believe that it is worth every penny. Evernote is an absolutely amazing tool that keeps getting better. Evernote recently announced new pricing levels and features. The best part is the less expensive middle level gives features that used to be part of the premium level. Current premium users were moved to the new premium level. There is still a free version, so don't worry. 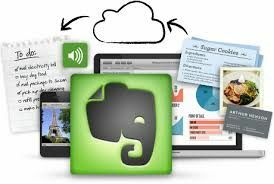 Evernote Basic - free - can install on multiple devices, supports up to 60MB in monthly uploads and 25MB individual note sizes. Evernote Plus (new) - $2.99/ month ($24.99 per year) - 1GB montly uploads, individual notes up to 50MB, offline access to notes on mobile apps, passcode lock of notes and ability to turn emails into notes in Evernote. Evernote Premium (upgraded) - $5.99/month ($49.99/year) - unlimited monthly uploads, individual notes up to 200MB each, presentation mode, search in Office documents and attachments, Chat, annotate PDFs, scan and digitize business cards, and more. Evernote is an excellent app that is well worth the price. Go here to sign up for an Evernote Account. David Andrade is a Educator, Educational Technology Specialist and Education Administrator in CT. Before teaching, David was an Aerospace Engineer for 10 years.He is the author of theEducational Technology Guy blog, where he reviews free educational technology resources for teachers, discusses ways to use technology to improve teaching and learning, and discusses other issues in education. He is also a professional development trainer, educational technology consultant and presenter at conferences. Check out his blog at http://educationaltechnologyguy.blogspot.com/ for more resources, tips, links, information and more. Follow him onTwitterandGoogle+.